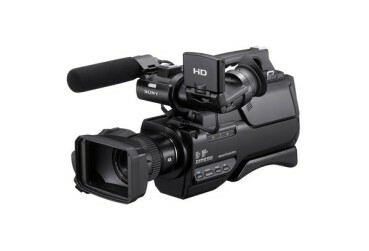 The HXR-MC2000U is a professional, shoulder mount AVCHD camcorder. This camera is ideally suited for customers stepping up to file based workflow. It records high-def. AVCHD or DVD quality MPEG-2 standard-def. onto its built-in 64GB solid state drive or to readily available, consumer memory cards. With premium design characteristics and full-raster high-definition 1080i recording capability, the HXR-MC2000U is ideal for weddings, corporate communications, colleges, universities, sporting events, and working videographers on a budget. Wide angle professional quality Sony G Lens technology provides exceptional image fidelity. 12x zoom: 2.8mm to 36.8mm provides wide angle of view (29.8mm in 35mm equivalent). 1/4" back-illuminated Exmor R CMOS sensor offers exceptional low-light sensitivity (3 lux). Quick AF system improves precise auto focus even in low light situations. Full raster 1920 x 1080i AVCHD high definition recording at up to 24Mbps. DVD quality Standard Definition recording. Built-in 64GB solid state hard disk drive can store up to six hours of HD video recorded in FX mode (24Mbps). One Media Card Slot conveniently accepts: SD/SDHC/SDXC and Memory Stick Duo / Memory Stick PRO Duo / Memory Stick PRO-HG Duo media cards. Assignable lens ring allows precise manual control of focus, exposure, white balance, iris and shutter speed. 2.7" (measured diagonally) PhotoPlus touch screen LCD technology brings higher contrast and brightness to the LCD display. Optical SteadyShot® Image Stabilization and Active Mode SteadyShot mode provide tenfold camera shake reduction even on the telephoto end. In addition, Active SteadyShot corrects camera sway that occurs while walking. Shutter Speed (Time) 1/60 ~ 1/10,000 sec. Recording Media 64GB internal Solid State HDD.